The next-door neighbour of Prince Eugene of Savoy′s Belvedere Palace is the Palais Schwarzenberg, a smaller, but still very opulent palace in the style of a "Garden Palais". Please see my article on the Palais of Vienna for an introduction to the palatial mania of the late 17th and 18th century. The Palais Schwarzenberg is typical for the period after the Second Turkish Siege and can be tracked back to 1697. In this year, Count Heinrich-Franz of Mansfield and Prince of Fondi hired the star-architect Johann Lukas von Hildebrandt to design himself a fancy summer palace outside the city walls of Vienna. The area had been looted and flattened by the Turks some 14 years earlier and so land was relatively cheap; as a powerful statesman and army officer of the victorious Austrian armies, the Prince of Fondi could afford direct rivalry with Prince Eugene. 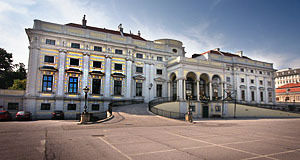 The stretch of land that he bought boardered to Eugene′s and the Belvedere Palace was seen as Johann Lukas von Hildebrandt′s masterpiece by Vienna′s ruling class. Now he was in charge with beating himself. The plans were approved and the construction started, but a few years later, when the building was still not finished, the Prince of Fondi died. In 1715, the property was sold to another influential statesman, Prince Adam Franz Karl of Schwarzenberg. With the financial powers of the Schwarzenberg family, the Palais was finished as a gem of Baroque representation - the gardens in particular were of rather exceptional extravagance. Lukas von Hildebrandt′s nemesis and senior at the court, Johann Bernhard Fischer von Erlach was hired to design the outlay of the garden and a sophisticated water-supply system, operated with the first steam engines of the Habsburg Empire. Needless to say, the Palais and gardens of Palais Schwarzenberg became a key-stage for courtly life in Vienna. In the 19th century, most of the Baroque parks of Palais Schwarzenberg were strongly altered into what is now an English-style landscape garden - no geometric formality, but an idealised, pastoral nature-concentrate in the middle of Vienna. When a water pipeline from the Styrian Alps was finished to supply Vienna with fresh, Alpine spring water, a fountain was built right in front of the Palais Schwarzenberg - the Hochstrahlbrunnen. Throughout the centuries, the Palais Schwarzenberg remained in the hands of the Schwarzenberg family, one of the most distinguished houses of the Habsburg Empire. In WWII, it was damaged by bombs, but repaired soon after the fighting ceased. The Soviet army built a memorial for the soldiers who had died in WWII right between the Palais Schwarzenberg and the Hochstrahlbrunnen fountain - an enormous piece of Soviet art, which will surely have pleased the Schwarzenbergs to find in their frontyard. It is subject of the Austrian National Treaty (a very important document for the foundation of the Second Republic in 1955 and for positioning Austria between the Western and Eastern powers) that Austria has to care for the maintenance of the memorial and is not allowed to tear it down (as it happened in many formerly communist countries after the collapse of the Soviet Union). Today, the Palais Schwarzenberg is home to a few companies, the Schwarzenberg family when they are in Vienna, a hotel, a restaurant and the Swiss Embassy. Neither parks nor palace are therefore open to the public, but even from walking around or as a guest of the restaurant / hotel, you can discover some interesting details. For example the many references to the defeat of the Turkish army - decapitated Turks were a popular reference to this finest hour in Austrian history and are part of the coat of arms of the Schwarzenbergs. At the Palais, you find them as ornaments in the garden fence. Another claim to fame is that the gardens of the Palais Schwarzenberg contain the only vineyard of central Vienna. In 2007, the current head of the Schwarzenberg family, Karl Schwarzenberg, became foreign minister of the Czech Republic and likes to emphasise how Bohemian he is (despite of being dual citizen and having spent most of his life in Austria). Attractions nearby are numerous: The Belvedere, the Funkhaus, the Karlskirche, the Wien Museum, the Musikverein, the Salesianerinnenkirche and Gardekirche Churches, the Arsenal and a bunch of other key attractions.